Interstate 170 was a planned spur to the north side of Downtown Baltimore from I-70 in the western portion of the city. Approved by AASHTO on June 30, 1970, the short section of I-170 was completed in 1979. I-170 was signed along the route until 1983, when U.S. 40 replaced it from adjacent Franklin and Mulberry Streets. 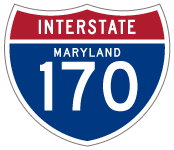 Since Interstate 70 was never constructed in Baltimore, I-170 was never completed to its planned western terminus. A subsequent proposal called for turning the route southward to the planned interchange linking I-70 with Interstate 95 by Carroll Park. Had it been built, the urban loop would have been numbered as Interstate 595. A green out on this guide sign along Martin Luther King, Jr. Boulevard northbound concealed what was a shield for Interstate 170 west. U.S. 40 follows the freeway across the viaducts spanning the six-lane boulevard ahead. Photo taken 10/01. U.S. 40 eastbound at the Martin Luther King, Jr. Boulevard off-ramp. The freeway continues to an end at Greene Street. Photo taken 01/01. Looking from the U.S. 1 overpass to the West at the former stub end of Interstate 170. This structure was demolished by 2011 to make way for a two parking lots for the MARC West Baltimore station. Photo taken 01/01. Looking west at the U.S. 1 overpass and unused roadway for I-170. Pavement here was removed during construction for the MARC parking lots between September 2010 and summer 2011. Photo taken 01/01.